Cass grabbed a sweater from the closet and sighed with relief. Everything was taken care of; the kids were settled and her sister in-law, Linda, had the phone numbers, insurance cards and bedtime instructions for the evening. Liz waited in the driveway. She greeted her sister with a smile and peck on the cheek and buckled up. Liz pulled away from the curb. They rode for a mile or two in the quiet. The groom, cousin Mike, and his sister, Kim, lost Ted, their Dad, to cancer last year and still hadn’t recovered. As soon as she said it, Cass felt the rise of hair on the nape of her neck and shivered; warning number one, she thought. The older Cass got, the easier it was for her to know when and where her clairvoyance would come into play. Though most of the warning signs were subtle and easily missed, this one persisted, making it harder to dismiss. “Got a chill?” Liz asked, closing her window. Liz shrugged, then put on some old big hair band music. They sang to the songs, harmonizing the rest of the way to the church. Ten miles later, Liz pulled into the parking lot beside Resurrection Church, an ornate cathedral in a neighboring town. They found some familiar faces and talked until two white stretch limousines pulled around the circular drive and deposited the wedding party. It was chaos, of course, ushers lining up with bride’s maids, all the guests milling about, etc. Cass finally gave up on trying to find her cousin, Kim, who was in the wedding party, and nudged Liz into the church. As usual, Cass pulled Liz to the front, joining her other cousins in the fourth row. What is it with Catholics avoiding the front pews? Cass mused. Cass Knelt and said her prayers. When she straightened, she felt that tickle again. She scanned the time-worn frescos and the intricate, stained glass windows, not knowing what to expect. The sanctuary really was a grand holy place filled with beautiful art. As she looked over at the altar, she gasped. A fluttering image hung in the air, to the right of the bronze, life size crucifix. Did she hear Ted’s infectious laughter? Cass followed the image as it swooped to and from near the alter. “What is it?” Liz asked, watching Cass with concern. “He’s here, Liz, “she whispered, grabbing Liz’s hand. Cass followed the translucent form back to its place by the crucifix, gesturing her head toward it. “Uncle Ted, he’s here and he’s up to something.” she said. Liz opened her mouth to say something but the processional music began and she and Cass stood to watch the bridal procession, whatever she wanted to say forgotten. The pestering tickle continued as Cass watched the procession. She found it difficult to concentrate; she kept rubbing her neck with her hand to try to stop the sensation. And to make matters worse, every time she felt the tingle, she heard Ted’s laughter. Talk about frustrating! But she did her best and kept her eyes on the rosy cheeked bride’s maids halt-stepping down the center aisle. They each wore a chic, off-the-shoulder black and cream gown, accompanied by the ushers in matching tuxedos. Then Michael took his place and the string quartet began “Ode to Joy”. His future bride, Debbie, and her father marched down the satin carpeted isle. Debbie wore a lovely Cinderella gown, not too full in the hips and tight in the bodice, accenting her slim waist. Cass sighed, remembering her own wedding. She wished her husband Jake was here, too, but his unit had been activated. She missed him so much. Being here made her heart ache for him. She prayed every day he would come home safe. The music stopped as Debbie and her father reached the altar. Debbie’s Dad placed her hand in Michael’s and the wedding mass proceeded. Cass watched for the flickering image, but the form did not appear and the tickling and laughter faded. The tingle returned just as the ring blessing began. What happened next, happened so fast, she almost missed it. The Monsignor asked for the rings. Michael turned to the ring bearer and picked up the bride’s ring. As he turned back to the Monsignor, his hand seemed to fling the ring into the air. The ring landed behind the alter with a loud “Twang!”. Then it rolled under a chair. The altar boy crawled to fetch it. Cass watched the blob of light circle the alter, the faint echo of his laughter present in her mind. The ceremony concluded without any other interruptions. “It wasn’t Mike’s fault.” said Cass. “What do you mean, not his fault? The darn thing flew over Monsignor Barrett’s head!” she said, imitating the gesture with her own arm. “Do you think Mike did it on purpose?” Cass ventured. During the reception, Cass ran into the new MRS. Coletta in the powder room. She congratulated Debbie, then commented on Michael’s faux pas with the ring as Debbie showed it to her. ” Yeah, just a fluke,” Cass agreed, as they left the bathroom and went back to the party. A few months later, Cass ran into Kim and asked how the newlyweds were doing. Kim mentioned the DVD of the wedding and again the hairs on the back of Cass’s neck rose and she shivered. “Are you cold?” Kim asked. The day dragged and every hour seemed like an eternity. She just had to see that recording as soon as possible. When she finally put the kids to bed, she practically ran to the laptop and put in the DVD. She fast-forwarded to the ceremony, her stomach tightening in anticipation. There! What was that? She scrolled back, pressed play and watched in amazement as Michael reached for the ring, turned to the Monsignor, his arm jerking away from his body as if he was pushed. Since the camera was positioned behind and to the right of the alter, Cass couldn’t search for Ted’s ghost. But that wasn’t what she was looking for anyway. The look on Michael’s, Debbie’s and the clergy’s faces confirmed, to her at least, that Ted was indeed up to something that day. Ann Chiappetta M.S. is an author and poet. Her writing has been featured in many small press publications and collegiate journals. Ann’s nonfiction essays have been printed in Dialogue magazine. And her poems are often featured in Magnets and Ladders. Her poetry is also included in Breath and Shadow’s 2016 debut anthology, Dozen: The Best of Breath and Shadow. 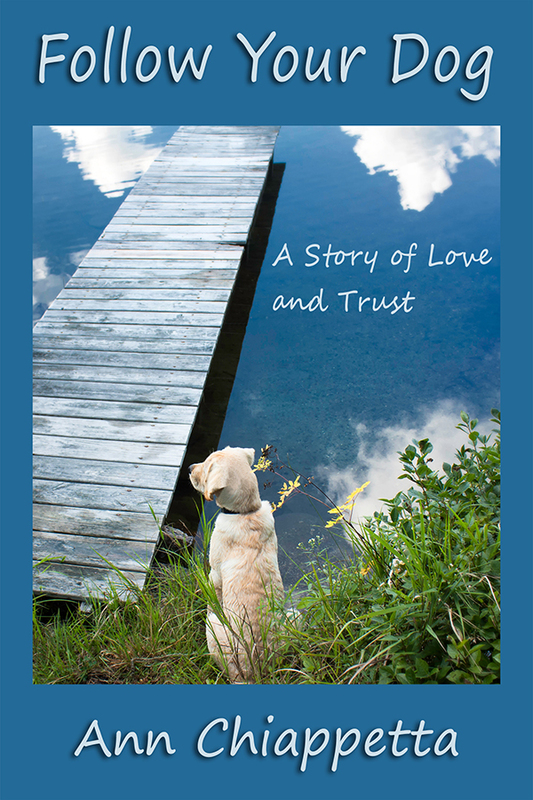 Her first collection, Upwelling: Poems and Follow Your Dog A Story Of Love And Trust, released in 2016 and 2017, are available in both e book and print formats from www.dldbooks.com/annchiappetta/. What, exactly, does it mean to share one’s life with a guide dog? While there is practical merit to the human-canine bond, which developed over a period of 70,000 years, it’s not akin to any other human-animal relationship. It is unique. The person and guide dog are interdependent, and the bond of mutual trust is what makes the partnership successful and fulfilling for both. Ask yourself how many people you would trust with your life, and after answering, ask yourself if you would trust an animal with your life. Unless you are bonded to and live with a working dog, you might hesitate in answering the second question. This entry was posted in Guest post and tagged ghost, marriage, psychic, story, wedding. Bookmark the permalink. Hi Sue, thanks so much for helping my story be read and appreciated. It was a pleasure to have you as my guest, Annie. Thanks sue, for having yet another of my Totally Talented Tell-It-To-The-World Marketing clients as a guest on your blog. It looks as though several took seriously the link I sent to them concerning your many wonderful ways to promote themselves. Iâm very glad to see them featured on such a magnificent blog. It is my pleasure, Patty. This is a great story, naughty Uncle Ted.